Most countries are giving less and less every year to a program designed to eliminate global poverty by 2015. The 2012 list of how much money the world&apos;s wealthier countries gave to international development schemes is out. They are giving less and less. The stats are from the cheerily-named Organization for Economic Co-operation and Development (or OECD), which studied its members. Aid was down 4 percent last year and 2 percent in 2011, according to a statement. The downward trend is the steepest reduction in aid in 15 years. The interminable European economic crisis is a key culprit in this. The numbers show aid budgets crashed hardest in Spain, Italy, Greece, and Portugal—nations slammed by the five-year meltdown. Spain reduced its aid budget by 50 percent, according to Devex, which tracks the international development industry. The downturn in government agencies&apos; giving is particularly painful this year, which coincides with the run-in for the United Nations&apos; so-called "Millennium Development Goals." A set of development benchmarks the U.N. has created to eliminate global poverty by 2015 (spoiler alert: we won&apos;t), the Millennium goals include guaranteeing basic things like water and shelter for all of the world&apos;s people. Last week, the international body marked 1,000 days until the 2015 deadline. Many of the programs designed to help developing nations reach the Millennium goals are backed not by NGOs, like the Red Cross, but by government aid budgets. The program began in 2000 with the goal of eliminating the worst impacts of human poverty within 15 years. 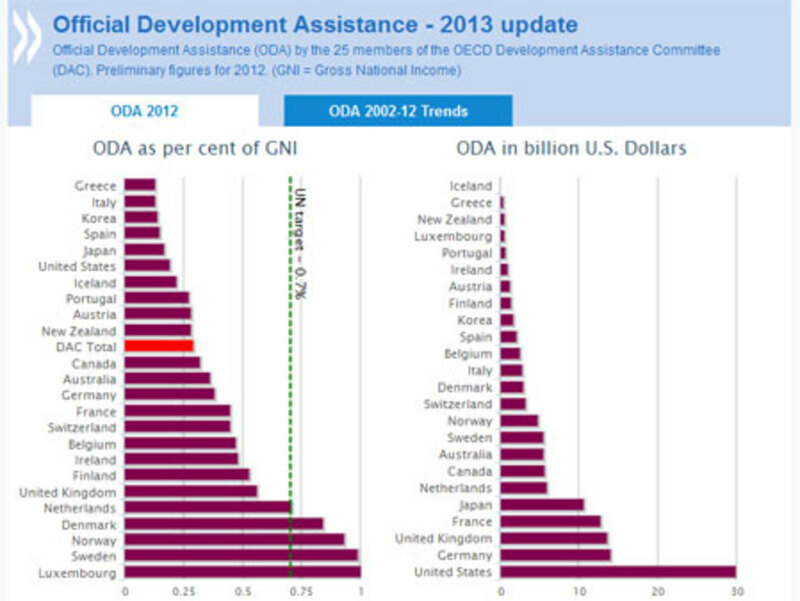 The above graph shows OECD members&apos; progress toward the key aid benchmark of contributing 0.7 percent of each nation&apos;s GNP to foreign aid. Ain&apos;t happening. Every country whose purple bar ends to the left of the green dotted line gave less than 0.7 percent last year—just three years out from the deadline. Only Denmark, Norway, Sweden, and tiny Luxembourg met the budget goal. The United States gave the largest amount of overseas development aid in the world last year. Taken as a percentage of its financial wherewithal, however, America gave slightly less than Iceland. Also, probably less than you yourself did.